Aviatrix supports connectivity between its Gateways in the cloud and on-premise routers using a feature called Site2Cloud , as shown below. This document outlines how to get connectivity established between an Aviatrix Gateway in AWS, Azure, or GCP and your on-premise router or firewall. 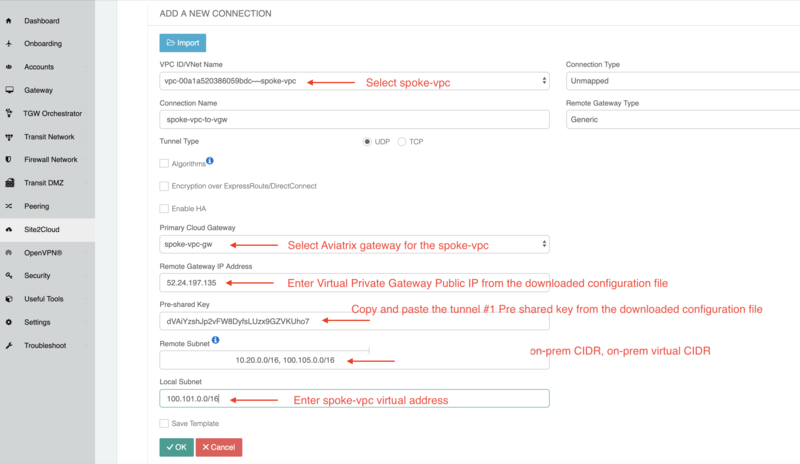 VPC ID / VNet Name Select the VPC or VNet where this tunnel will terminate in the cloud. Remote Gateway Type Generic , AWS VGW , Azure VPN , Aviatrix , or SonicWall . See below for additional details. TCP tunnel type requires an Aviatrix gateway on both sides. Algorithms Defaults will be used if unchecked. See below for more details. Encryption over ExpressRoute/ DirectConnect An additional field will be displayed if checked. Remote Gateway IP Address IP address of the device. Remote Subnet Enter the CIDR representing the remote network. Local Subnet The CIDR block of the local VPC/VNet subnet. If left blank, Aviatrix will use the full VPC/VNet CIDR. The remote and local subnet fields can contain multiple values. Use a comma (,) to separate the values. Remote Subnet(Real) Enter the real CIDR of the remote network. Remote Subnet(Virtual) Enter a virtual CIDR that will represent the real subnet. Local Subnet(Real) The real CIDR block of the local VPC/VNet subnet. If left blank, Aviatrix will the full VPC/VNet CIDR. Local Subnet(Virtual) Enter a vritual CIDR that will represent the real subnet. If you use multiple values for the real subnets, you must use an equal number of subnets in the virtual field. Generic Use this option for most third-party routers and firewalls. AWS VGW For terminating on a AWS Virtual Private Gateway, select this option. Aviatrix When terminating on an Aviatrix CloudN on-premise gateway. If the Algorithms checkbox is unchecked, the default values will be used. If it is checked, you can set any of the fields defined below. Enter the subnet(s) using a comma to delimit more than one CIDR. If you leave the local subnet field blank, the default value is the VPC/VNet CIDR. If you enter a value, make sure you include the VPC/VNet as well. These Local Subnets are advertised to Remote Subnets that the site2cloud connection can reach. Once a connection is created, you can download the configuration or edit parameters. To do this, select Site2Cloud from the navigation menu and select the connection you just created. You can generate remote site configuration template. Select the remote site device from the dropdowns provided. If your remote site device is not listed in the dropdown menu, simply select an available one in the menu or use the Generic/Vendor Independent template. This template file that contains the gateway public IP address, VPC CIDR, pre-shared secret and encryption algorithm. Incorporate the information to your remote router/firewall configuration. If the remote gateway is a Aviatrix CloudN, go to site2cloud and simply import the downloaded configuration file and click OK. This field is not applicable to Site2Cloud connection established by Transit Network workflow. Dead Peer Detection (DPD) is a standard mechanism (RFC 3706) between IPSEC tunnels to send periodic messages to ensure the remote site is up. By default DPD detection is enabled. This field is only applicable to Site2Cloud connection established by Transit Network workflow. By default, Aviatrix Transit GW advertises individual Spoke VPC CIDRs to VGW. You can override that by manually entering the intended CIDR list to advertise to VGW. This feature is critical to limit the total number of routes carried by VGW (maximum is 100). To enable it, click Site2Cloud on the left navigation bar, select the connection established by Step 3, click to edit. Scroll down to “Manual BGP Advertised Network List”, simply enter the field with a list of CIDR blocks separated by comma, then click “Change BGP Manual Spoke Advertisement”. To disable the option, leave the field blank and click “Change BGP Manual Spoke Advertisement”. By default, Aviatrix Transit GW does not advertise Transit VPC CIDR. When this feature is enabled, Aviatrix Transit GW advertises the Transit VPC CIDR to VGW. The Controller programs the 3 RFC1918 routes in AWS route table to point to the Transit GW. It also programs the learned routes from VGW into the AWS route table. If you deploy instances in the Transit VPC, enabling “Advertise Transit VPC CIDR(s) mode allows the instance to communicate both to Spoke VPCs and on-prem network, assuming the Spoke VPCs are in the RFC1918 range. To enable this option, click Site2Cloud on the left navigation bar, select the connection established by Step 3, click to edit. Scroll down to “Advertise Transit VPC Network CIDR(s)” to enable. By default, Aviatrix Spoke VPCs do not have routing established to communicate with each other via Transit. They are completely segmented. If you like to build a full mesh network where Spoke VPCs communicate with each other via Transit GW, you can achieve that by enabling “Connected Transit” mode. All connections are encrypted. To enable this option, click Site2Cloud on the left navigation bar, select the connection established by Step 3, click to edit. Scroll down to “Connected Transit” to enable. Note all Spokes should be either in HA mode or non HA mode. A mixed deployment where some Spokes have HA enabled while other don’t works in a normal environment, but does not work when a failover happens on a HA enabled Spoke. Aviatrix site2cloud supports all types of on-prem firewall and router devices that terminate VPN connection. Below are configuration examples to specific devices. Real world use cases sometimes require a combination of site2cloud and other features, such as SNAT and DNAT. Here are a few documents in the Tech Notes session that demonstrate how you can solve some of them. Site2Cloud for overlapping IP addresses. Site2Cloud to public IP addresses. To check a tunnel state, go to Site2Cloud, the tunnel status appear next to the connection. Diagnostics and troubleshooting options are available in the Diagnostics tab. You must first select the connection, and then select an Action, followed by OK.